The essence of Smiths Art (MozArt) was the will to have every Smiths sleeve as well turned out as possible, and it came from an idea I had to take images that were the opposite of glamour and to pump enough heart and desire into them to show ordinariness as an instrument of power – or, possibly, glamour. The sense of place that is integral to so many American pop songs has few equivalents in British pop. There are no motor routes as rich with promise as Route 66, no music cities that sing so seductively as Memphis or Nashville, no streets as enticing as those of New York or San Francisco. American pop uses place to evoke freedom, possibility and the reinvention of both self and space. British pop accommodates itself to a cramped island, so loaded down with history, myth and literature that the songs can buckle under the weight. Place, if it is conjured at all, is conjured obliquely. One way of setting a mood or context used to be the album cover. The sleeve, especially if it was a gatefold or had an insert of the lyrics, could be pored over even before the LP was placed on the turntable (an arcane ritual that seems to be undergoing something of a revival), and then further scrutinised while the music was listened to. The album cover was freighted with meaning, often esoteric, sometimes unyielding, but always present. And the desired sense of time and place could be evoked by the photography and design. Think of Abbey Road, with the Fab Four walking, together apart, across the NW8 zebra crossing. Or Ziggy Stardust, with Bowie fallen to earth in a Heddon Street made other-worldly. Or the Who walking away from the piss-stained monolith at Easington Colliery on Who’s Next. Or the Proclaimers gazing out over Leith’s sprawling totality on Sunshine on Leith. 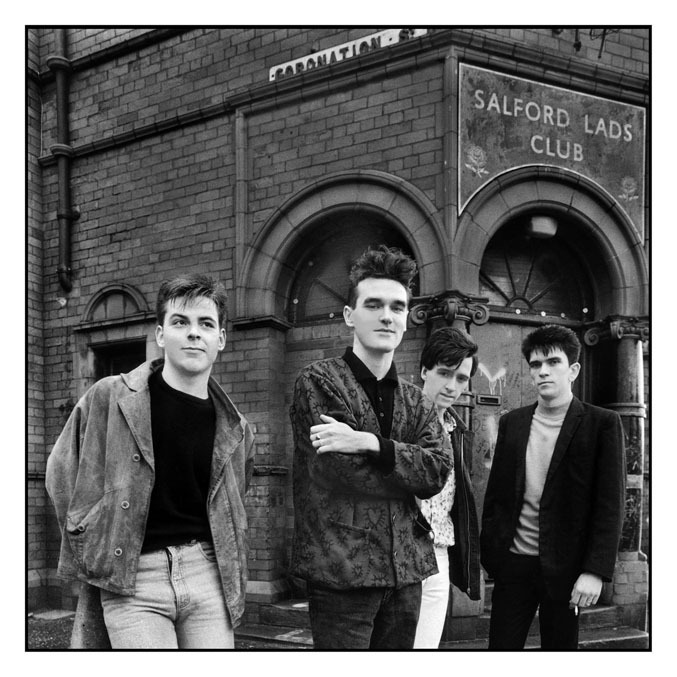 And then there is The Queen is Dead with its inner sleeve photograph of the Smiths outside the Salford Lads Club. When the Smiths made their arrival I was old enough to be cynical about pop music but still young enough to care. Oh how we mocked Morrissey when he appeared on Top of the Pops with a bunch of gladioli stuffed in the back of his jeans, but still we knew that the Smiths were making the most vital music since the heady days of punk. It’s almost thirty years since The Queen is Dead was released. That’s as far away from the present moment as Presley’s ‘Hound Dog’ and Perkins’ ‘Blue Suede Shoe’s were from that third Smiths’ album. 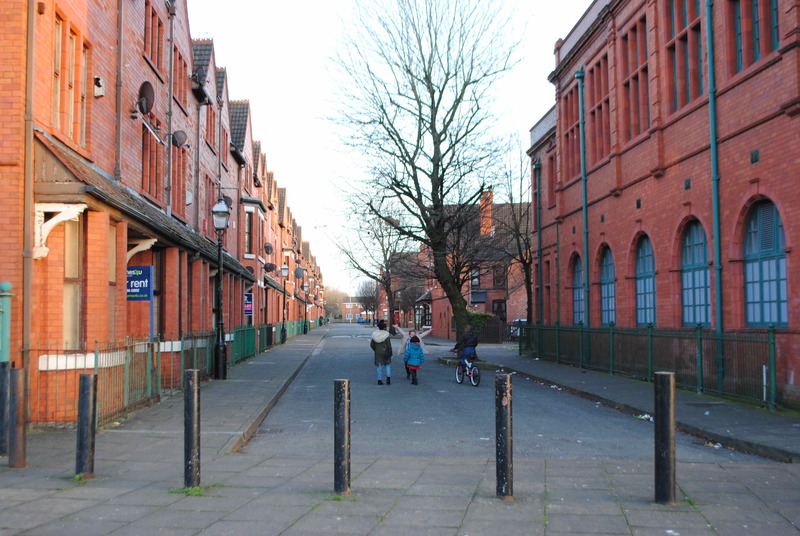 And yet the music of our youth and early adulthood exists in its own eternal present, just as the Smiths will always stand before the Salford Lads Club, self-assured, bound for glory, the opposite of glamour.